When it comes to ecommerce, the landscape is cut-throat. Merchants have to fend off 13% more competition every year, and larger players are increasingly taking a cut. Amazon alone was even predicted to drive 80% of all ecommerce growth last year. Barriers to entry have never been lower and, simultaneously, acquisition challenges are mounting. Today’s customers are empowered with an abundance of choice meaning they’re more likely to shop around to find the cheapest options. Plus, with some describing the modern day consumer to be “adlergic”, the energy spent on acquiring new customers can fall on deaf ears. It turns out that an estimated 12.2 million people, in the UK alone, use ad blockers at least monthly. So how can you cut through the noise of big brand players and reach the customers who matter to you most? The customers you already have could be the answer. They already know and trust you and, if nurtured effectively, they’ll be more likely to return and buy from you again. Over time, these customers become invested in your brand for the long haul. As a result, they’re more likely to recommend you to others. With 83% of online shoppers saying that they trust recommendations from friends and family over other forms of advertising, focus on these customers is vital. This post explains how to nurture this loyal and engaged customer base so they act as advocates on your behalf and drive more customers to your online store. It may seem obvious, but before leveraging your loyal customers as an acquisition tool, you first need to identify who you’re going to be focussing your attention and marketing dollars on. With a loyalty program, you can easily dive into the data and track which of your customers are your most loyal – and therefore most valuable. First, take a look who’s spending the most. On average, loyal customers spend 67% more than new ones. Look at the data to learn who is adding the most to their carts and repurchasing from you most often. Next, look out for the customers who are engaged with your brand. These are the avid followers that can’t help but click your marketing emails, engage with special offers and seek out what’s new each season. They’re the customers you can guarantee to like your social media posts and drive others to follow you. Finally, look at the customers that are speaking up about your brand online. This could be through positive reviews left on your site and on external review channels. Also, be sure to look at the customers who are talking about you on social media and tagging you in posts. Once you’ve identified your most valuable customers you can then begin working on nurturing them to act as advocates on your behalf. Research shows that happy customers tell as many as nine friends about their experiences with a brand. And, 82% of emotionally connected customers will not only promote a brand to their friends and family but will also spend more. Once you’ve identified who your happy customers are, you can then get to work on making them feel special and showing them that you appreciate them. Make your customers feel valued by offering exclusive member-only deals – such as free shipping. To add another level of personalisation, offer these customers a free gift on their birthday based on their purchasing behaviour. Maybe they’ve been eyeing something for a while but are waiting till payday to bite the bullet. Surprise and delight them with a discount on that specific product and let them know in a loyalty email addressed only to them. You could even nurture this relationship by adding your most loyal customers into an exclusive loyalty tier. They’ll feel part of a collective cause meaning they will be more excited to share your brand with others. 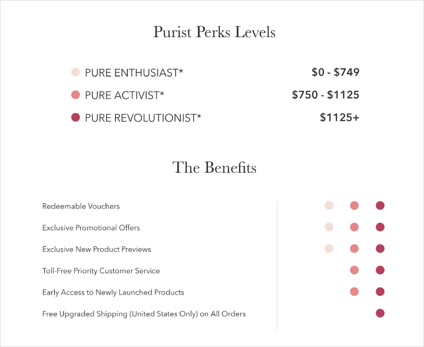 100% Pure even encourage advocacy through the name of their tiers – “Pure Enthusiast”, “Pure Activist” and “Pure Evolutionist”. Each name, and the rewards claimable, gives customers motivation to complete more actions to reach the next tier. Trust is a key part of attracting a new customer base. By using your existing, happy customers to build emotional bonds with a curious shopper base, you’re building a more authentic experience. Use the trust you’ve built with your existing customers – who are now your brand advocates – to win over the hearts of new customers. Social proof can be the difference between an abandoned cart and a completed purchase. With ecommerce making it difficult for customers to experience the product in the real world, reviews can act as a valuable source of social proof that encourages customers to convert. In fact, 84% of customers trust online reviews as much as they do personal recommendations. Customers want to hear from other shoppers just like them before committing to their purchase. Use your loyalty program to encourage your new advocates to leave more product reviews. Notify them in post-purchase pages and emails that they’ll receive loyalty points to spend on their next purchase if they leave a review. As a result, these positive sources of social proof will act as evidence to tentative shoppers and will increase your conversion rates. A loyalty program also makes it easier for your customers to make referrals. Customers acquired through referrals spend 200% more than the average consumer as they’re more predisposed to trust your brand. They know the person who has referred them had a good experience and therefore expect that they will receive the same. This level of trust diminishes any of the doubt that a fresh customer may have when completing their purchase. It also saves them valuable time as they no longer need to shop around to find the best deal. Offer points and rewards to customers who recommend your brand to close ones. This can be encouraged by making it extra easy for customers to make referrals through any channel – including email, Facebook Messenger and Whatsapp. A loyalty program allows you to give each customer a unique referral URL so you can easily track who are your strongest advocates. Don’t forget to make the referral beneficial to both parties. Reward the existing customer for sharing their referral link and also gift a reward to the new customer when they complete their first purchase. This way, you’re nurturing the referred customer to become an advocate further down the line. With the fight for new customers getting fierce, it’s important to think of smart, new ways to draw new shoppers to your site. Your loyal customers are a treasure chest of opportunity. They are already emotionally invested with your brand and love to engage with you. Be sure to make them feel special and they’ll happily act as advocates on your behalf. LoyaltyLion is a data-driven loyalty and engagement platform trusted by thousands of ecommerce brands worldwide. Merchants use LoyaltyLion when they want a fully customised loyalty program that is proven to increase customer engagement, retention and spend. Stores using LoyaltyLion typically generate at least $15 for every $1 they spend on the platform.